Jefferson College is a public junior college 30 miles south of St. Louis, MO in Hillsboro. In keeping with its mission to foster balanced student growth, Jefferson College provides its students with a wealth of extracurricular activities, including athletics, theatrical and musical performances, outside concerts, and public events. 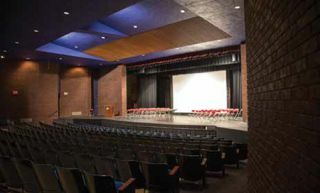 The school recently funded an overhaul and modernization of the sound reinforcement systems in its 2,500- seat field house and in its 300-seat theater, which included high-performance Ashly Audio KLR-Series amplifiers in the field house and Dante-ready nXe-Series network amplifiers in the theater. Ashly Audio KLR-Series amplifiers were installed in the field house at Jefferson College. “Of course, the field house is used for women’s volleyball and men’s basketball,” said Paul Murdick, president TSI Technology Solutions, the firm that installed both systems. “But it’s also used for commencement and other large assemblies. The theater, which is located inside the Fine Arts Building, is used to showcase the college’s drama, dance, and music performances, and the college also rents it out for concerts and other public events. However, the existing sound systems in both venues were very old and needed to be replaced.” David Bick and Josh Rasch, acoustical engineers with McClure Engineering’s St. Louis division, designed both new systems. The field house’s new sound system starts with two Sennheiser evolution 300-Series wireless systems, two Sennheiser MEG 14-40 microphones with MAT 133s bases, and a CD player. Their outputs feed a Shure SCM-810 mixer, which in turn feeds a Harman BSS BLU DSP system. Two additional Sennheiser evolution 300-series wireless systems, a CD player, and a series of existing wired inputs directly feed the Harman BLU DSP system and are controlled in a stand-alone mode by either BSS Contrio Keypads or via the Harman HiQnet Motion Control app installed on an iPad. Ten channels of Ashly amplification (one dual-channel 1,000W KLR-2000, two dual-channel 800W at 70V KLR-3200s, and two dual-channel 2,500W KLR-5000s) power a distributed system consisting of nine Renkus-Heinz TRX 151/9 loudspeakers for the main sports arena, four Renkus-Heinz TRX 61 loudspeakers for two low-ceiling areas in the arena, SoundTube CM890D loudspeakers for the lobby, and Lowell 810 loudspeakers for the conference room. The new front end for the theater consists of 10 Sennheiser evolution 300-Series wireless systems and a Sennheiser MEG 14040 microphone, along with existing microphones, all of which feed via Dante-networked audio channels through a Harman BSS BLU DSP. This allows for a complete stand-alone system operation exclusive of the Allen & Heath GLD-80 mixing console. System control is via the Harman HiQnet Motion Control app on an iPad and integrated BSS Contrio Keypads. All Dante network audio channels also feed the GLD-80 as a front-of-house mixer for use during larger events. The system can be further expanded when additional channels are needed through the addition of the Allen & Heath AR2412 portable stage rack. Listen Technologies assisted listening systems and Juice Goose UPS and TCP/IP-controlled power sequencers complete both the field house and the theater systems.